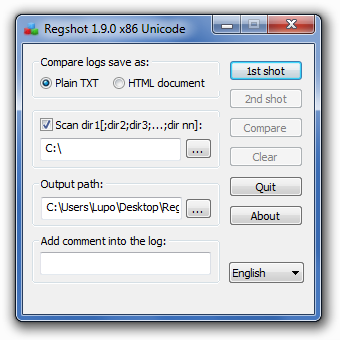 Description: It is a small registry compare utility that allows you to quickly take a snapshot of your registry and then compare it with a second one (done after doing system changes or installing a new software product). The changes report can be produced in text or HTML format and contains a list of all modifications that have taken place between the first and second snapshot. In addition, you can also specify folders (with subfolders) to be scanned for changes as well.